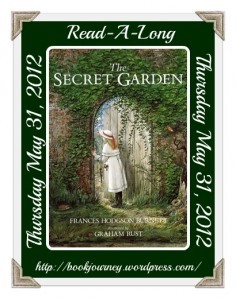 A Literary Odyssey: The Secret Garden by Frances Hodgson Burnett-Readalong Post. 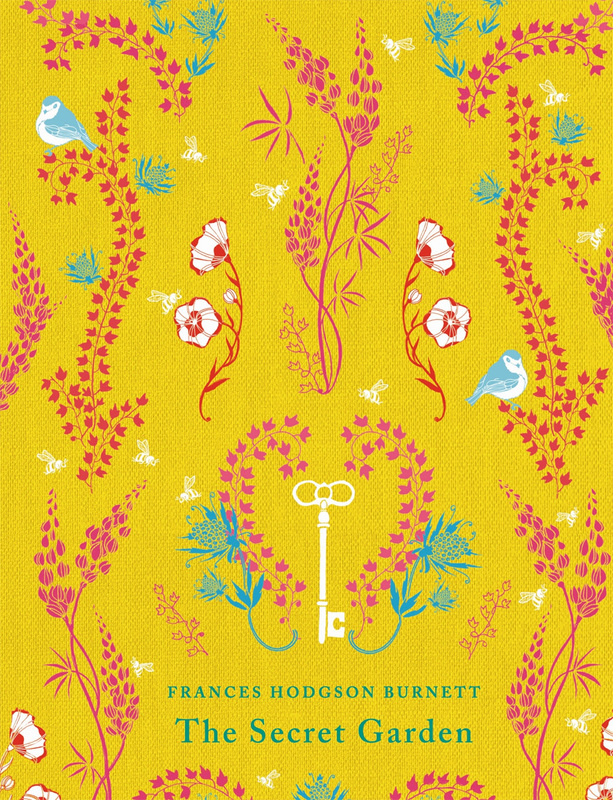 The Secret Garden by Frances Hodgson Burnett-Readalong Post. I've been craving a reread of The Secret Garden ever since Jillian read it a couple months ago. Then I saw the readalong hosted by Sheila at Book Journey, and I knew I had to join. I hadn't read this since I was a little girl. My best friend when I was 7 or 8 was a girl named Emily. We would often exchange books back and forth, and this was one she was hesitant to give me, since she loved it so much. She finally lent it to me over a long weekend, and I cherished her copy of the book. I read the whole thing that weekend and brought it back to her in school on Monday. I think I asked to borrow it one or two more times, but she said no and I never managed to get my own copy as a girl. So when Puffin released their hardcover children's classics, I snapped them up and was excited to finally own a copy of a book I loved as a child. Since placing the yellow beauty on my shelf in November, I've been eying it in hopes of reading it soon. Did it live up to my expectations? It sure did. The Secret Garden is really the story of two spoiled and selfish children. The first is Mary Lennox. Growing up in India, Mary is spoiled and unwanted by her parents. She stays indoors and bosses around her maids. But when she is orphaned, she sent off to England to a relative's house and left to her own devices. Without anyone to listen to her whining and complaining. The other child is Colin-the son of Mary's estranged Uncle-and a supposed cripple. Sheltered in a small room almost since his birth, Colin has been told he is sickly for almost his entire life. He has fed into that knowledge and believes himself to be far sicker than he is. The magic of the story comes when these two children meet and begin fixing up and playing in the secret locked garden. There, Mary and Colin learn a great deal about themselves, with some help from Dickon, and grow up. I loved reading this again as an adult. I remembered bits and pieces about the garden from my read as a child, but there were so many lovely passages and characters lost in memory. First, Dickon. I remembered him slightly as being a character I was overly fond of, but I was blown away by his appearances in the novel. Dickon was always a supportive, loving figure to Mary and Colin, and far more mature than his age. The pieces of the robin interacting with Mary were charming, and I loved that the robin brought about an unselfish side to Mary (the little robins on my book cover are also quite charming, aren't they?). More than anything, I loved the magical and hopeful quality of the book. Both Mary and Colin undergo changes and maturity throughout the course of the novel. Both change from selfish, self-absorbed little creatures, to people who learn to care about something other than themselves. Together, with Dickon, they help the garden grow and flourish. They breathe new life into something once forgotten and neglected...much like how they were treated by the adults in their lives. They showed that value can be found in lonely and forgotten places, if you care to look and see the potential it has. This is a book I can't wait to share with my own children. I can already picture reading it to them from between the yellow covers and letting them discover the magical quality of the secret garden for themselves. I was a part of the read-along too. This book was such a fun re-read! I had forgotten how much I loved it! I absolutely loved this book, how much actually surprised me. 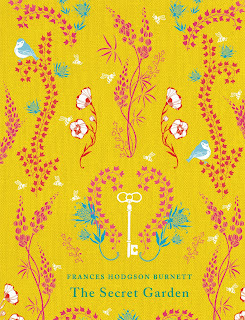 And I agree, the Puffin covers are gorgeous and I already have a list of the ones I need to buy. I wish I had known about this readalong before! Somehow I have never managed to read The Secret Garden, but I read and loved A Little Princess as a child, which is by the same author I believe. I have never read this one all the way through. I KNOW! I KNOW! Heather (CapriciousReader) and I will be buddy reading it when she gets back from vacation. Really excited! Glad to hear you enjoyed this book. I was introduced to the movie first and recently reread the book and rewatched the movie. The movie is surprisingly well done and it's only as an adult I recognized how amazing it was. One of my best friends gave her copy of this book to me when I moved from IL to California for graduate school... it's now 6 years later and I still haven't read it. Unfortunately, the book is in storage thousands of miles away BUT I do plan on getting all my things (LOTS OF BOOKS) come vacation time in November, so when I finally have the book in hand, I'll shoot it to the top of my TBR pile. it's a classic over 100 so you can download it for free to any ereading device including your pc ! enjoy any time you want! Ah, a well-loved book from my childhood. I have my own copy now, but when I was little I read my mom's illustrated (by Tasha Tudor) edition. Have you read A Little Princess? That was another favorite of mine, perhaps even more so than The Secret Garden. i loved that Little Princess movie! as i did The Secret Garden, but now I've read the book and there's just soooo much more in the book that's missed in the movie..
Like Amanda, I think A Little Princess is better than The Secret Garden. I recently read this too and was surprised at how inspiring it was for me. I read it during a very scary, unsure pregnancy and the book gave me a message of hope and good attitude. Beautiful blog by the way! I remember really enjoying this as a kid, and you have definitely made me want to re-read it. glad to find you were reading along and now part of the Party! enjoy your gorgeous new copy !! i read mine on kindle - yay! I love this book!! And I am so glad I found the Garden Party too!!! I wish I had the cover above!!! I loves your post and the story of your childhood memory! I enjoyed reading your comments here to - thanks for joining the party! The Secret Garden is so magical -- and I've only read half of it. But growing up hearing the story of Mary Lennox and watching various adaptations, it's very near and dear to my heart. I'm thrilled to hear it lived up to your expectations. Adding the right garden decor to your garden can make your garden even more beautiful and more unique. Oftentimes, it is not a new rosebush or geranium that you need -- rather, you might just need some beautiful garden art. My Victorian Celebration Reading Plans. Warbreaker Post 1: Chapters 1-12. Independent Novel Projects and Catch-22. Weekly Wrap-up for May 21, 2012: Only a Day Late. The Pearl by John Steinbeck. Top Ten Tuesday: My Top Ten Future Project Books. Book 144: A Passage to India and Book Stats. Book 143: Antigone by Sophocles. Book 142: Murder in the Cathedral by T.S. Eliot. An Uncommon Education by Elizabeth Percer. Weekly Wrap-up for May 6, 2012. In Need of a Reading Day. Why Maintaining Your Identity is Important.